Yippee Fri-Yay Mother F… oh shoot, this is a family friendly blog. Might have to rethink that. Happy wife will be in full swing tonight because we’re going to see Three Days of Rain and I am super excited! 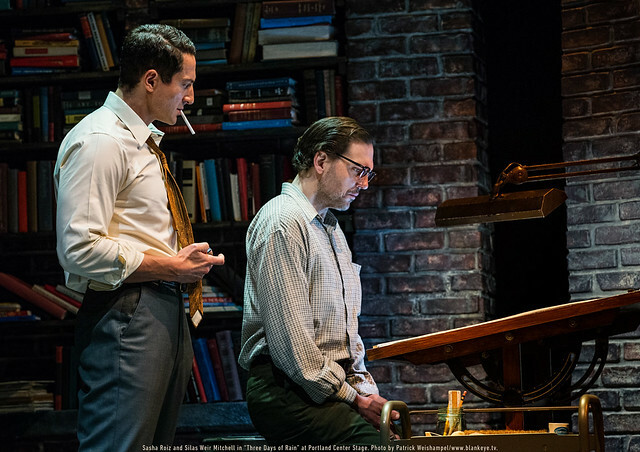 Portland Center Stage puts on great productions, and their latest one stars two of the actors from the NBC television show Grimm! I love the show and I love that the actors love Portland so much that they wanted to be part of a local production. #sashaandsilasshow The Gerding Theater is a good sized theater but small enough to still feel intimate and everyone gets a great view so it’ll be a treat to see some TV favorites on the stage in person. Throw in dinner beforehand with my man and that’s a great date night! I was thrilled to hear about the Jem and the Holograms moving being made, until I saw the trailer that came out last week. This article, with a tweet from William Shatner, nails my thoughts on it! The producer has said we should reserve judgement and that we’ll be pleasantly surprised, but I don’t have high hopes. I freely admit that I watch too much TV, so much that at certain times of the year I’ll obsessively be Googling to see what shows are getting cancelled or renewed, and what new show pilots are premiering. During a recent obsessive Google session, I found out that Forever has been cancelled and it makes me hate the world. Why were more people not watching this show??? Yes, it was a cop drama and 90% of shows on TV are, but this one had just the right mix of a mysterious sci-fi background story, great chemistry between the lead characters with little glimpses of the romance that could be, and a quirky sidekick. It was a familiar setup but still felt new and original which is hard to come by these days. And if none of that intrigues you, then these two words are all it should have taken: IOAN GRUFFUDD. How sad is this letter from him regarding the cancellation? Makes me love him and the show even more! I care so much that I actually signed a couple of petitions linked here to save it. Who knows if it’ll work, but there are rumors that another network could pick it up or maybe it’ll get saved by Hulu (like The Mindy Project) or Netflix (like Longmire), but other networks won’t know it needs saving unless fans show an interest! Speaking of Hulu and Netflix, since we have accounts with them we’re considering getting rid of cable and just using our Amazon Fire TV thingy to watch all the streaming stuff. There are so many new shows that are exclusive to those networks (channels? streamers? what are we calling them?) that look good too! Seems like a cheaper deal overall compared to cable. Anyone else doing that? Pros/Cons? Any other Forever fans out there? Are you mourning the loss of any shows like I am? Please admit it so I know I’m not alone! Is anyone else embarrassingly excited for Fall TV premieres? My DVR is quaking in fear! I love seeing all the new shows that come out and am often surprised at the ones that get picked up over the ones that get cancelled. Then there are the shows I already love from past seasons and they’re FINALLY coming back. So, let’s break it down! Back in the Game – Two words: James Caan! It also has Maggie Lawson from Psych and she’s just adorable. Marvel’s Agents of S.H.I.E.L.D. – Duh. Once Upon a Time in Wonderland – I heard there was going to be a Once Upon a Time spinoff and wasn’t too interested but then I watched the whole trailer and it looks really fun! The Goldbergs – Who doesn’t love the 80s? Super Fun Night – Rebel Wilson is hilarious so hopefully this is written well. Trophy Wife – Bradley Whitford, Malin Akerman, Marcia Gay Harden. Yes. Yes. Yes. The Crazy Ones – Sarah Michelle Gellar!! Oh, and some guy named Robin Williams. We Are Men – Tony Shaloub!! The Blacklist – I’ll watch anything James Spader does! Dracula – Vampires. No other reason needed. Ironside – Hello Blair Underwood! I’m also happy to see Spencer Grammer from Greek in something new – oh, and she’s Kelsey Grammer’s daughter. Smartypants here just figured that out, ha! The Michael J. Fox Show – Michael J. Fox. No other reason needed. He ranks up there with vampires. Sean Saves The World – Sean Hayes is hilarious and I’m glad to see Megan Hilty on a new show after Smash was cancelled too soon. Welcome to the Family – I was going to pass on this one but then I watched the full trailer and it looks really funny. I like Mike O’Malley from his “Yes, Dear” days as well as Kurt’s Dad on Glee, and I’m glad to see Mary McCormack from In Plain Sight in something new as well. Enlisted (midseason) – I like all these dudes! Us & Them (midseason) – I adore both Alexis Bledel and Jason Ritter, can’t wait for this one, hopefully it’s as cute as it looks! Rake (midseason) – Greg Kinnear! The Originals (midseason) – Vampire Diaries spinoff. Whew! I think that’s all. Oops, can’t forget Haven on Syfy that just returned last week, love that show! If you think you don’t like science fiction, or if you think Syfy only does shows like Sharknado, you should check out Haven! See, I told you I was ridiculous. Like really ridiculous. I have the shows listed out with their premiere/return dates on my phone and I have already set recordings as far out as the DVR will go. Someone please tell me I’m not the only one that does this! Contrary to the evidence presented here, I swear my life does NOT actually revolve around television. I can go days without even turning it on, but during premiere weeks it gets a little out of control. I know. I’m shaking my head too. Do we love any of the same shows? What are you most excited for this Fall?